Tonight's strange, fanciful, in some parts wonderful episode definitely felt reverse-engineered. Larry David (or one of the writers) clearly thought that the image of Larry hanging on for dear life from some woman's love handles would be hilarious—hilarious enough to build an entire episode just to lead up to that one ridiculous, surprising, thoroughly preposterous image. Was it worth it? Well, you have to admit, the sight of Larry hanging off of Maureen's muffin top while his feet dangled off the roof was pretty funny. So, yes? But Larry using Maureen's midriff as a life preserver wasn't the weirdest part about tonight's episode. In fact, the whole thing seemed to follow Jerry's musing about comedy writing in the beginning of the episode: "What's real got to do with what we do?" Jerry has a point, of course. Comedy doesn't strive to be realistic; it strives to be funny. The worlds of Seinfeld and Curb are worlds unto themselves—worlds that often bear little resemblance to reality. 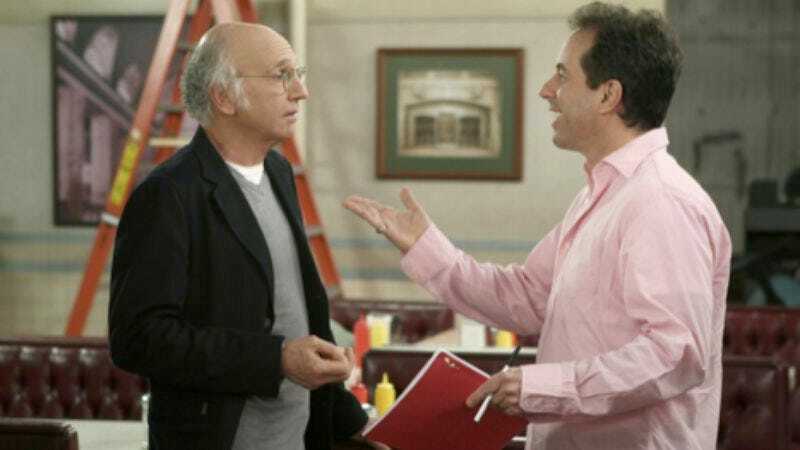 And, as if to prove it, we have tonight's episode of Curb, an episode that seems to be shouting, "No amount of weird, ridiculous set-up is too much for a good joke!" Let us count the unrealistic elements that lead up to that rooftop, shall we? Tonight's episode was a veritable crash course in suspension of disbelief. First, there was Maureen's proud display of her bulging spare tire at work. Would any adult woman in 2009 actually wear a belly shirt like that to her office job? Unless her job happens to be in-office model for some t-shirt company that's manufacturing outdated, plus-size belly shirts, uh, no. But that long, awkward scene where she was tinkering with the air conditioner, her puffy muffin top on full display to Jerry and Larry was really, really funny. Next up, there was the Jesus pee tear miracle, aka Larry David's own personal Piss Christ. Is it believable that Larry pees like an out-of-control firehose on full blast because of some medicine he's taking? Sure. Is it then believable that his errant urine would splash onto a picture of Jesus' face that's near the toilet in Maureen's house? Sure, why not? Is it at all believable that Larry would see the pee tear of his own design on Jesus' face and not wipe it off? Uh, no. No one would leave their host's bathroom literally dripping with their own urine, if they could at all help it. But if Larry didn't run out of Maureen's house like spooked, neurotic deer, then Maureen and her mom never would have thought they'd witnessed a miracle—which was an important card in the unstable, unwieldy house of cards that lead up to Maureen's rooftop lovehandle rescue. Still, Larry should have wiped it off. Anyone would have wiped it off. Then there was Larry's arrest for what we can only assume was a charge of shoplifting napkins. Would this ever happen anywhere? Nope. Was it worth it to see the pizza shop owner struggle to narrow the suspects down to Larry and black Larry? Not really. In this case, I think the set up was much better than the resulting joke. The scene in the pizza shop where the owner caught Larry taking more napkins and told him, "I had a handicapped kid in here yesterday. You know how many napkins he got? Two." lead to a really funny exchange. But, of course, that preposterous napkin shoplifting line-up was really part of the set up to get Maureen's mother to pick up Larry in her classic car, which she lets Larry drive, which then triggers a traumatic flashback to her Larry-look-alike husband's tragic death by honking when Larry honks at Richard to pull over. Lewis goes into the trunk to take out the bat he's carrying around as a gift for Larry, and Maureen's mom goes berserk and drives into Lewis. Was it funny? Yes. Was it worth all that plotty set-up? To me, anything that involves Larry dressed in his 1960s best yelling about schmohawks is kinda worth it. All in all, though, the best parts of this episode tended to be the quieter, more grounded parts—the whisper argument about who will confront MuffinTop Maureen (Larry can use that in his cellphone) between Jerry and Larry; the flaunt/not flaunt ratio exchange between Larry and Maureen; the scene at lunch when Jerry and Larry both refuse to scoot over in the booth, and so Richard leaves in a huff; the awkward scene with Cheryl, Jerry, and Larry; the discussion about whether or not the handicapped use more napkins—in other words, the more "real" parts. Accidental Jesus pee tear miracles and napkin shoplifting line-ups are fun, but sometimes the absurdity can get a little thick. Real—well the Curb version of "real" which is to say "very very neurotic"—can be very funny on its own. No Larry David's Piss Christ needed. —"You think Nixon could have been Nixon in Frost/Nixon?" ZIng. —"Go with your gut." Bigger zing, Jer. —"I'm fine with the whole thing. The protuberance. The whole thing." —Poor Richard Lewis. First Larry causes his break-up, then he ignores him at lunch, then he doesn't call back after they're disconnected, and then Larry causes him to get hit by a car. It really isn't Lewis' year. Of course, no year is Richard Lewis' year. —"Tomorrow let's wear tweed jackets…we'll have a good writing day." A-ha. A glimpse into the David/Seinfeld writing process.